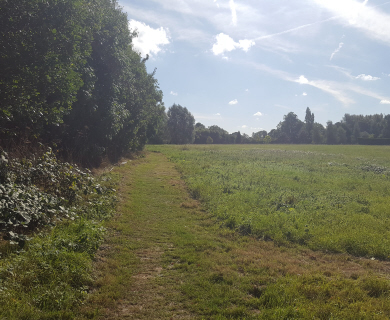 This little walk is a real gem for a bright autumn day with wide open fields and fine views. The start is in Manuden and we recommend that you take time to explore the church and some of the interesting buildings in the main street. There is a map of the parish fixed to the wall just by the north gate to the church. At the time of writing (in September 2010) the Yew Tree Inn is undergoing refurbishment and is not open for business just yet. 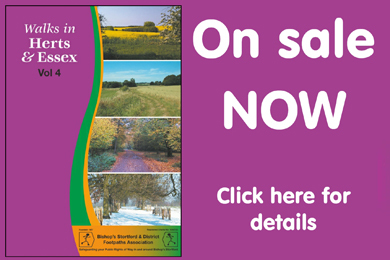 Surfaces: Country lane, farm tracks and good field paths. Obstacles. No stiles, some steep slopes, could be a bit muddy during wet periods and a bit exposed when cold winds are blowing. Start along the lane to the right of the Yew Tree Inn signposted to Pinchpools and Rickling. Notice the large pudding stone by the entrance to the pub yard. Go over the bridge and round to the left. Follow this lane for about 700 yards; the River Stort and hedges containing a lot of hops are on the left. You will reach a finger post indicating a footpath to the right between two young ash trees. Take this path up the hill past the trees on the left and at the top of the rise take a breather and enjoy the views. Also keep an eye on the sky for the pair of buzzards often to be seen circling in the area and which sometimes come close to give you the once-over. 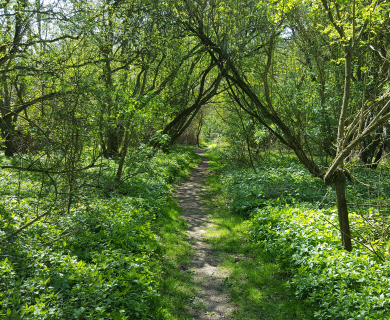 The path comes to the corner of a wood where you turn left and at the end of this wood the path crosses a narrow strip of field to the next wood and continues down the righthand side of the wood and over a footbridge to reach a farm track. Turn right to follow this track uphill for about half a mile. You will pass a large oak tree by a pond which has for long been a watering place for the local deer. It is at present dried up due to the drought, but still offers much to interest the naturalist. At the very top of the slope you come to the edge of Wakelings Wood. From this vantage point on a clear day with glasses you can see to the north the two brick towers of the Clavering windmills and beyond them to the high ground where the Stort rises. To the south one can see the spire of St Michael’s church at Bishop’s Stortford, the spike of St. James’ at Thorley, and water towers and chimneys at Harlow and beyond. In the spring orchids, oxlips and violets in the wood. are visible from the path. Carry straight on past the wood and start the descent to Bollington Hall Farm. Near the skyline ahead you might be able to make out Henham Church. The track leads into the farmyard and you keep going down through the buildings to emerge on to a gravel track. Turn right on this which leads to a tarmac surfaced road and at the top of the slope where the road turns left, carry straight on to the right of the row of cottages along a gravel track. This will wind down and up and past a wood on the right, across an open field and come to a hedge on the right. About 40 yards along this hedge turn right at the waymark post. The path turns back for a few yards on the other side of the hedge before swinging to the left to follow a field-edge path to the top of the slope. Now carry on straight ahead for about half a mile across open fields towards a clump of trees on the near horizon. These fields are a favourite haunt of hares but their numbers seem to have dwindled during the last couple of years. This may be due to buzzards taking the young hares or perhaps the increasing number of large dogs being walked in the area have chased them off. The oak tree, or maybe one of its antecedents, at the corner of the clump of trees ahead used to be a boundary marker between the parishes of Stansted and Manuden. 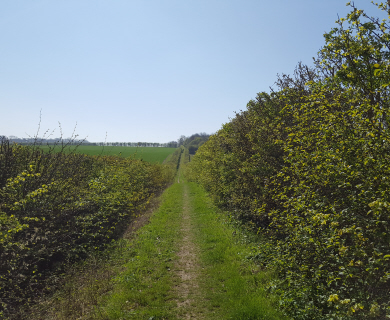 When you reach these trees the path turns left and then right through the hedge, then follows the hedge to the left, round the field and down to an evergreen hedge. More views here over Manuden and the Stort valley. At the evergreens turn left to reach a gate which opens to the top of a grass field. Descend this steep field with its ancient lynchets, probably terraces dug out of the slope where the peasants were allowed to grow their vegetables on the poor soil. 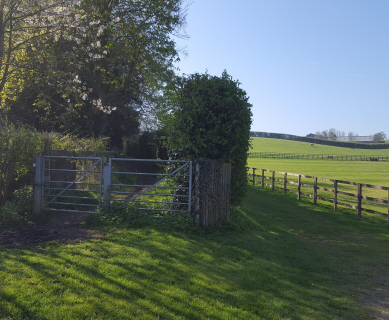 A few yards down the hill turn right by the white-walled cottage onto a gravel track between the houses, at the end of which bear half left to cut across and down the pasture to a gate by the electricity substation in the far corner and back to your starting point. I have recently covered much of this walk and was struck by the abundance and variety of wild flowers and insects along the hedgerow going up to Wakelings Wood. This reflects the attitude of the local farmer who does not spray his crops willy-nilly. This is now the end of July and there should be a good display of flowers throughout august. The buzzards mentioned in the walk directions have raised a family and early in the day there was a lot of noise from the fully fledged young ones who wanted their breakfast. As soon as it had warmed up enough to produce thermals the whole family of five soared upwards to start the daily hunt.